Johnny Beecher Sheridan - Call on Dolly! John Beecher Sheridan was on a plane once with Angela Lansbury, having performed in a tribute to her for a Sarah Siddons Award in Chicago. He had been flown out to speak on behalf of her Gypsy company. She asked him what his favorite show was that he had done. Being politically correct, he told her it was working with her…but that if he picked something, it would have to be the Dolly tour. It was so many things. 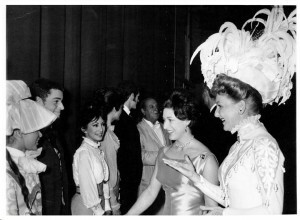 It was a national tour, it was an international tour, it was Mary Martin, Miss M. the company called her. As a teenager, he was uncomfortable referring to her in any other way. It was the biggest hit in New York and they were traveling with it. It was a principal role for him although he didn’t have his own number. He was not a seventeen year old in the third line of the chorus. He learned a lot from Martin. He learned that even at seventeen, eighteen, and nineteen, he couldn’t be up late and do a matinee the next day. He learned discipline. He learned that he couldn’t scream at an ice capade one night and perform at optimum level the next. Even though he wasn’t the star, he learned that his lifestyle had to adjust as if he were. He went to Vietnam, Okinawa, Korea, and London. He learned to work on a raked stage at the Drury Lane. He met the Queen. After all that, he came back to the United Stages and worked with Betty Grable, still one of the biggest movie stars in the world doing two shows a night seven days a week in Las Vegas and learning a whole new discipline with that. There were many cuts to shorten the show to accommodate the two show a night schedule! He is John Sheridan professionally, Beecher is his family name. There was another actor with a similar name. So, eventually John started using Sheridan professionally in 1973. Dolly came into John’s life when David Merrick was producing a show called Dolly Levi, A Damned Exasperating Woman. 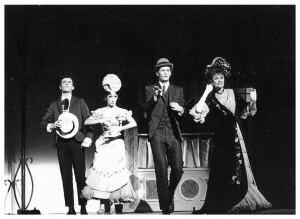 John was appearing in the off-Broadway show, Best Foot Forward. Also in that cast was David Hartman! Hartman played the grad who sang Buckle Down, Winsocki . The producer, Arthur Whitelaw, who would go on to produce You’re A Good Man Charlie Brown among other things, became a personal manager for Kay Cole who eventually went into A Chorus Line. He was also sort of managing John’s career. John was sort of understudying Liza Minnelli in Best Foot Forward in one number that she usually did with three girls. She was out sick a few times and John filled in in that number in that one scene and number. Judy Garland’s TV show was running at the time and Liza went out to shoot an episode. The company knew about this two weeks prior to Liza going out to shoot the episode. 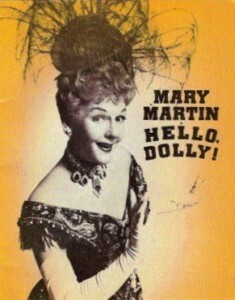 Dolly was casting about the same time and both Arthur Whitelaw and John knew about the role of Barnaby Tucker due to its original source, The Matchmaker. At the time, John was fifteen. Arthur was able to get someone from the David Merrick office to come in and see John when he was filling in for Liza! They were there to see David Hartman, as well. Arthur was told that they liked John but that his “demeanor” was too young. That was John’s introduction to Dolly. The show eventually opened and we all know it was a hit. David Hartman had gotten into that show. Later on, when they were casting the international tour starring Mary Martin, John once again got an audition for Barnaby. David Hartman was in the show on Broadway and was also the ASM (assistant stage manager). He was reading with people auditioning. John remembers that they were standing stage left at the St. James Theater. John sang very well but “botched up” his reading. He was thinking in terms of the guy who had gotten the part. David Hartman told those that were casting that he didn’t know what John was doing, but that he could do better. David got him in to see the show the next night. After seeing the show, John had a different idea of how Barnaby should be played. Jerry Dodge was playing the part at the time. When John went back for the call back, he knew how to play Barnaby and got the part. He was in his last year of high school. They went into rehearsals in the spring in New York. They rehearsed at the Variety Arts Studio on West 46th Street between the Lunt-Fontaine Theater and the Edison and Paramount Hotels. There is a parking lot there now. At the time, there was a five story building. It was directly across the street from the Forty-sixth Street Theater. They rehearsed there for a few weeks and then moved the rehearsals over to the St. James Theater. Every night after the show, the stagehands would leave out one set. Even in those days, it cost a lot of money to utilize the stagehands beyond their usual time. A little bit of light would be left on to allow the rehearsals. One night they would have the Feed store set and they would rehearse those scenes. The next night it might be the Harmonia Gardens, etc. The international company was also the first company to do the polka contest. On Broadway, Come and Be my Butterfly was still being performed. For several days, they came in, warmed up, and Gower would proceed to choreograph the polka contest. The polka contest would eventually go into the show when Ginger Rogers took over for Carol Channing where it remains to this day. Gower was never happy with the Butterfly number and the Polka contest was the last change Gower made to Dolly! The tour lasted for five months in the United States, starting out in Minneapolis, and including Kansas City and New Orleans, and Canada before heading to Japan for three weeks and was supposed to go on to Russia and London. (Susia would end up cancelling its scheduled performances). 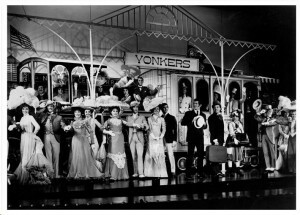 John celebrated his eighteenth birthday on the train between Kansas City and New Orleans along with Caryl Hinchee, also in the cast. They had a birthday cake in the lounge car. From New Orleans, the tour went to Dallas and then on to Memphis. John had gotten tonsillitis during rehearsals in Memphis. It was summer and they were really acting up. He just tried to do his best. He had to go to a throat doctor in Memphis who was going to try and keep him out of opening night. He told the doctor he could possibly be fired. The doctor patched him up a bit and sent him on his way and after Memphis, they went to Indianapolis, Cleveland, and then on to Toronto (The O’Keefe Center) when John had made plans to have his tonsils taken out. At the O’Keefe Center, there were these little rooms on the sides of the theater on each floor and all around the theater. There are these little panels where you can actually stand in these rooms and see the stage on each extreme side of the stage. One night, shortly after opening, John was in one of these rooms watching the Dolly number. His understudy, Ed Goldsmid, was the last one in the line doing the duck walk. Ed is throwing himself into the number and doing the duck walk like it is nobody’s business and gets to the center and ends up doing a cartwheel in the air and lands on the conductor, Jay Blackton, who had braces on his hips. They both ended up on the pit floor. The assistant conductor/pianist immediately took over. They were at the tag ending of Hello, Dolly! The first thought that John had was not, “Oh my God, are they hurt?” It was, “Oh, S! @#, I’m not going to be able to get my tonsils out.” He was leaving the next day to get his tonsils out. Neither of them was hurt. It did, however, take some work like the tin man to get Jay Blackton back together! They had a little time before the polka contest started. Ed Goldmid got lost in one of the side rooms and he couldn’t find his way back to the stage. There was a search going on for him. The stage manager ran down to see if he was ok and he was wandering around. With the pit, there were two levels below the stage. He was walking around amid the catacombs and old drops and whatever was down there. He was ok.
Toronto was their only three week stand and John was able to leave the company long enough (ten days) to get his tonsils out and come back. Johnny had to get back in the show as soon as possible to make sure that this did not affect his voice. The threat was that were going to bring in Johnny Mineo from New York to replace John. They brought in a throat specialist to speed up the healing process. He had ONLY ten days! So, John did opening night, was out for ten days, and came back in two nights before closing in Toronto to assure everyone he was capable of continuing. Whilst John was in the hospital, his mother, who worked for a doctor in Jaimaca, Queens, suggested that since John was in the hospital, he should go ahead and get all the shots he would need before going overseas. The doctor said since he was already going to be in bed, they might as well give him all the injections. He was afraid of getting sicker and he had to be better in ten days and what if the trip to Russia got canceled anyway? He decided against the in hospital inoculations. He decided to get all of his shots at the same time as the rest of the company. When they were in Cleveland, they were playing the Music Hall. The Hannah Theater, also in Cleveland was set up for the cast to get some of their shots. At this point, they were getting shots in every city to prepare them for the international tour. In one theater they were performing in, it was set up for the cast to get shots after the show. The shots in Cleveland were for Cholera and were the worst of all the shots. It would completely numb the arm. They were all lined up military style to get their shots. You got a shot in each arm and then moved on. They were doing four people at a time. Some people were hysterical. John didn’t like it, but he’s never had a problem with getting shots. Two burly stage hands fainted after getting their shots! He remembers being so panicked and then it happened and it seemed like nothing. The worst shots were given when they didn’t have to perform the next day. From Cleveland to Vancouver, they spent three and a half days on trains. It was actually like four days off since they had that first day in Vancouver off. It felt like nothing when he got the shot, but the next day it was as if someone had duct taped his arm down. He was trying to carry two suitcases and a shoulder bag and he remembers kicking his suitcase along the street because he didn’t have two hands. He couldn’t do anything with one of his arms. It felt as if there was this lump in his arm. Some people were miserable on the train because of the pain. This went on for three and a half days of everyone only being able to use one arm. Speaking of the train, they were constantly changing trains on this tour. Normally, they would actually change trains once but they kept changing their cars. They would be disconnected, put on a side track, they would feel a jolt and then they would be connected to another train and on their way to their next destination. Most shows traveled by train in those days. From time to time, they would also fly. Martin and Halliday, of course, flew separately. There was so much freight with lighting, costumes, etc. that they got the passenger cars for nothing. It was cheaper to go by train instead of planes. Once the cars were left overnight in a station. They were all told that they could walk around town but that the station would be closing at a particular hour. They would have amenities in the train but not to wander off too much. One of the dancers, Gene Cooper, wanted to go out drinking. They told him that he couldn’t because he would not be able to get back in. He climbed over the fence during the night to get out. A couple of guys gave the cab driver some extra money and asked him to take Gene to the “Y”. He had to get off the train. He was going crazy. They asked the driver to come back and let them know where Gene was. Remember, there were no cell phones in those days. Who do you call on the train if it takes off? Little by little, word started circulating among the company that Gene wasn’t there the next morning. He still wasn’t there as the train pulled out of the station on their way to Vancouver. Word came down that he would not be fired as long as he was in Vancouver for the first show but that he would have to pay his own way. He made it back and everything was fine. After Vancouver, it was on to Seattle and then Portland. In Portland, they got word that they would not be going to Russia. 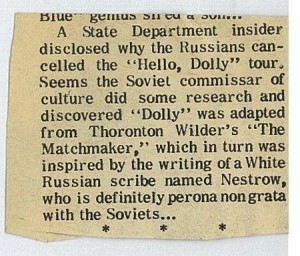 Everyone was watching the six o’clock news before heading out to the theater when it was reported that the Russians had cancelled the State Department’s tour of Hello, Dolly! starring Mary Martin. After Portland, it was on to Japan. They flew from Portland to San Francisco and then to Hawaii on to Japan. The sets had been sent by train from Portland to San Diego for Channing’s first national tour which was kicking off in San Diego. Obviously, there were a lot of questions. There was a woman in the company by the name of Ann Sharkey who seemed to know everything but knew nothing. She told everyone she had a call in to Washington! She was a sweet older woman who was sent on the tour as a diplomatic “go between.” That’s how they all first found out that they would not be continuing on to Russia. London was already in the works before all of this. When they were playing Clowes Hall in Indianapolis, big 3,000 seat hall where no one could see or hear them…a college campus in the middle of nowhere that they had to travel forever to get to…they had these meetings regarding London. John recalls Martin in a red leotard discussing London with the cast. She had already been offered London. She explained that she really desired for the entire company to join her in London. Merrick wanted the entire company but he was also dealing with an English producer, HM Tennent. Martin had already played London in South Pacific and Kind Sir. John once told Martin that he had the cast recording that he bought at an antique store as she was going up the back steps for the Dolly number. He started singing one of her songs to her. She said, “Where did you get that!?!? !” He told her that he simply bought it at an antique store. She told him she wanted that record. She thought they were all gone! One of the oldest chorus guys told John that he had heard that she tried to buy out all the records so there would be none around. She sang that Noel Coward show in a soprano voice. It was a bomb through no fault of Martin’s. Getting older, Martin felt that after Dolly she might not be offered the opportunity ever again. She felt that she had to go. She told the cast that she would not say that she would not go without the entire company but that she would certainly fight for it. She WANTED to continue with this company. She wanted to take to London the show they had. Having a new cast would be more work for her anyway. As it turned out, the principals did go…the chorus did not. The international part of the tour continued with Japan, Okinawa, and Korea. Martin was taking this around the world as Channing was leaving New York. 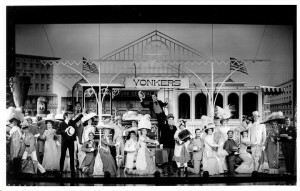 Rogers was continuing with the New York/Broadway production with the polka now added. Channing dealt with the polka being added from San Diego on. The Butterfly number was never done again. It was in Japan that the affirmative came through that they would NOT be going to Russia. The question now was how were the “principals” going to fill the time between Japan and London. Also, what was going to happen to the rest of the cast? It was also an odd time for the company as a whole. Martin’s husband, Richard Halliday, started becoming very manipulative around this time. There was a definite shift in his personality. Instead of being this wonderful affable guy who was part of the company up until this time, the company started getting these strange notes from the stage manager that hadn’t gotten up to this point. They were all from Richard and the gist was to keep looking at Martin. It wasn’t quite like “ Carol Channing…don’t stand in her spotlight.” When Carol was in Lorelei, cast members were asked not to stand in Carol’s “aura”. It was similar to that. Martin was also aware of this. She had been so friendly with the company. Everybody loved her. Everything changed. Even in the wings, she would be staring straight ahead or looking down and she stopped relating to fellow cast mates especially when Halliday was backstage. The entire experience was starting to shift and then when they went to Vietnam, it was a moving emotional experience with the soldiers. The company could not help but stand there and cry during the bows. Even with this, the morale of the company started to dissipate. Also, the future of the company breaking up was looming overhead. With British Equity some principals were cleared for three months, some for six, and some for ten. John was cleared for ten, as was Carleton Carpenter and Marilynn Lovell,but in the back of John’s mind, he was thinking that with the company splitting up, he would probably be ok for six. Martin’s contract was six months. Dora Bryan would take over for her when she left the company. It was at this time that discussions began regarding Vietnam. Osaka was being considered…to do the show there for a month to fill in. Russia was supposed to be Moscow and Leningrad. It was a year and a half contract anyway and no one really knew what was going to be at the end of that contract, anyway. They would just deal with that as they went. Around the time of the Russian cancellation, there were a lot of meetings. In Japan, there was a custom of forty five minute intermissions. There were restaurants around the theater and the audiences would order dinner prior to the show. During intermission, they would go and have dinner! The Dolly company did not want that fearing that the show was too long. The show wasn’t built for that. They were able to bring the intermission in at thirty minutes. During intermission, there were company meetings to discuss the fate and future of Dolly as they sat on Tatami mats. It was very controversial at the time even being in Vietnam. A war had never been declared and some people didn’t want to go. No one was afraid of getting shot. The concern was what was going to happen to the show. The show was already being considered a classic. Would a production in Vietnam turn into something they would be ashamed of? They knew they were going to be entertaining the troops but was it going to be like? Martin wasn’t at every meeting but when she was she shared her memories of entertaining the troops during World War II. She told the company that she lived in tents. It was all about rallying the troops. At this point, Martin was already slated to do I Do, I Do so Champion, Martin, and Merricj all had a lot to gain by being on the six pm news every night. “Martin just back from Vietnam preparing for her new Broadway musical.” The rest of the cast even questioned whether or not Martin would really be put in a tent! John was eighteen at this point and couldn’t imagine what it was going to be like. He had only seen movies. It ended up much better than what he had imagined. It was still crazy and not luxurious. They were staying in a hotel that hadn’t opened yet called the Maier Core. The hotel was like the bare bones of a hotel. They at least were not in an army barracks or tents. They weren’t living on a bus. They were certainly well protected under the circumstances. Even though people talk about North and Vietnam, there truly was no dividing line. One could go up on the roof and see the was zone all around. They were in Saigon for two weeks. They had a list of places that they were not supposed to go. They sometimes went anyway because of restaurants, etc. There were a lot of great French restaurants. There was an elegant hotel called the Caravelle with a revolving restaurant that they also went to from time to time. The bombings seemed to go in a cycle so there, once again, were certain areas they were told to avoid. There was a place behind the hotel they were staying in that was like a bowling alley. With their army coupons they could go there. They managed to eat well and there were drinks in the hotel. They would get brave enough to venture out of their comfort zone. The show itself was performed mostly on truck beds. Once they performed in a tiny movie theater that was taken over in which the stage was awful. They did shows every other day because they had to move their makeshift stages. It was very much like being a little bus and truck. Sometimes it was a mammoth airplane hangar. These would usually be indoors with no air conditioning. Other times, it was in more portable hangars. These were situations in which the front of a plane could be brought in to service the front of the planes. When they were performing in these situations, the company was covered but those sitting out watching the show were not. There would be several hundred at a time sitting on sand bags out in the hot sun watching the show. They performed to recordings of the Japanese orchestra. There were five musicians that played live to those tracks. They did the full show. Nothing was cut. They did have sets. They weren’t the same sets that were used previously in theaters. John, even then was interested in design, and was very interested on how these sets moved around. The ramp was recreated which was brought in from Japan. It was adjustable so they could fit it to the heights of the trucks. 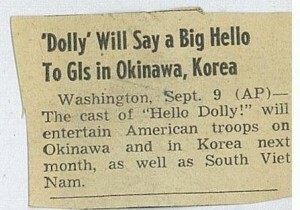 After Vietnam, they went to Okinawa. They played in a gymnasium. John also got sun stroke water skiing there every day. They were there for ten days and then went on to Korea. Then the company split up. The chorus was sent back to the states to rehearse and go into the Betty Grable company in Chattanooga, Tennessee which was pre Vegas and several cities, as the principals went to the Drury Lane Theater in London. It was an awful time with the “family” splitting up like this. As I wrote on my chapter on Carleton Carpenter, Carleton was seriously injured on the first day of rehearsal at the Drury Lane. When it was decided that he would not be able to continue with the production, he was replaced by Garrett Lewis. Until Garrett came into the show, Robert Hocknell, who played Rudolph and understudied Carleton, and had gone on a few times, filled in. Robert Hocknell actually opened in London and then they sent for Garrett. Gower wanted him to remain in the role of Rudolph. John worked with three Dollys. Mary Martin, Betty Grable, and Anne Russell who stood by for Grable and Martin. Martin was an enormous fantastic talent. She never missed a performance. When they were in Okinawa, they had to hold the show. Anne Russell was all made up and ready to go on. Martin was having bursitis problems, and in those days, they didn’t know as much about cortisone as they do now. They injected Martin and her face and body swelled up. They could hardly get the costumes on her. She STILL went on! John had not seen her and did not until they were in the hat shop scene. They had sung the last few bars of Sunday Clothes, but he was facing front. He remembers gasping audibly when he saw Martin’s head and face looking like a pumpkin. Betty, on the other hand, was out a lot. Being a heavy smoker, she had chronic laryngitis. Add on to that two shows a night, seven days a week!! John doesn’t understand how she agreed to it or how anyone would think a star could maintain that kind of a schedule. She was never off stage. She probably thought she could do it because she had done Vegas shows before, like Mitzi Gaynor. The first half hour was seven thirty and the second half hour was eleven thirty. Sometimes they would cut So Long, Dearie because it really isn’t a plot number. She would go out and do the best she could. Sometimes, she would come in and get as far as the Dancing number or Parade and that would be it. There was nothing else left. The stage manager would tell the company first and then the announcement would have to be made. Parade ends, blackout, “Ladies and gentlemen, due to illness, for the remainder of tonight’s performance, Dolly Levi will be played by Anne Russell.” Then quickly into the intro for Elegance. John feels that Anne may run a close second to Channing for the number of performances she has done. Throughout the seventies, she performed it on several cruise ships. (Check out my chapter on her). Grable was terrific and fun in the show. She didn’t beat the speeches to death. She just did it, simply. She clowned around in the hat shop scene, “Ripple, Ripple, Ripple…she had fun with it. They used to get out of the theater at two AM. Even at eighteen, John had to go to a doctor to get prescription sleeping pills. He couldn’t sleep because he was so wound up. There were blackout drapes in his apartment but the sun would still creep in. He recalls conking out once and waking up and calling the front desk to find out what time it was. When they said seven, in a panic, he asked if it was am or pm. He didn’t know if he had taken pills and slept all the way through. They were cranking out these shows and they would go out to dinner and a show at three am! The girl’s softball team, “Judy was fabulous on that team”, would play at four am!! There was an Italian restaurant that would give the cast a free dinner once a week. They would get heroes and go to the game. Everyone was going to bed when the sun was coming up. It was a crazy time! 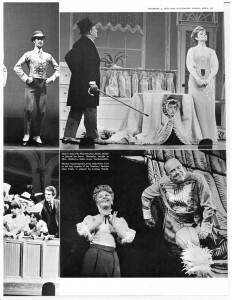 Prior to working with Martin, John had worked with Merman in Gypsy, one of the greatest Broadway stars ever. Over the years, he has worked with many stars as stated here. The one lesson he has learned from all of them is the consistency and professionalism no matter what. Lansbury had rough vocal days. Even with Mary, the cast recording was put off for two weeks. John still winces when he hears the album sometimes even though it has been reworked and remastered. You can only be as good as the original day. After being in the Orient and going to London, she came down with something. It was snowing and she didn’t want to record so they put it off for two weeks. They had to record so they could get it out for Christmas sales. 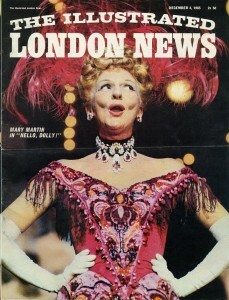 The Channing album had not been released in London so, at that time, there was no Dolly album in London. You could get it but you had to wait six to eight weeks after ordering it from New York. With all of that, she went on and did as full on as possible. Her entire day was built around being ready for those eight shows a week. It was the off stage stuff as much as the on stage stuff that John has carried forward with him. All about how you gear yourself and take care of your voice and your energy and continue no matter what happens. In London, the audiences were much more reserved than in their previous appearances. In Japan, there were translation issues, although they applauded at the end of every number. They certainly did not get the jokes. You still went out there and did it the same for all audiences. You did not speed through some performances to compensate for language barriers. Considering that John doesn’t go as far back as the George M. Cohan/Jerome Kern era, he says Dolly is still up there among the all time greats. Audiences are still loving it. When a good production of Dolly is presented, you can still hear the amazing reactions from the audience. You don’t have to rip out numbers and things that don’t work anymore. John has gone on to direct several productions of Dolly including Sally Struthers in the title role at the Ogunquit Playhouse (See my chapter on artistic director, Brad Kenney). As a director, John knows the show runs the gamut with the speeches to Ephraim and Cornelius’ speech and Ribbons Down My Back which comes after one of the shows biggest scenic production numbers with Put On Your Sunday Clothes. Less is more. John also asks his Mrs. Molloy’s, “Do you know how to compete with all those sopranos screaming C sharp in the previous number? By not competing with them! Go in the opposite direction. Hold back with ‘shining in my hair’.” There are all these levels that the show hits, not only with Dolly. You can’t wink at the audience and say, “Aren’t we funny?” Go back to The Matchmaker in which Dolly steps forward and talks to the audience. Period costumes and stories are always wonderful for the audience because you can leave the six PM news outside. As soon as the curtain opens, and you see those costumes and those stylized poses, you are in another world already. You can choose to go with it or not. John would have loved to have seen Doris Day play Dolly back then. She was “considered” for the movie for a brief moment. He also thinks that Mary Tyler Moore would have made a great Dolly. In 1966, she was headed to Broadway in a musical adaptation of Breakfast at Tiffany’s, also produced by David Merrick, but it never opened. At a point where she would have been age appropriate, she would have been great! Having been a director and a producer for most of his adult life, and having his hand in a lot of casting, he now realizes it is all so random. He can’t sit here at this point in his life and say they cast him as Barnaby in 1966 because he was perfect for the role. He has heard actors tell someone over lunch, “I knew I had that part at the call back!” What they don’t know is that they were the third or fourth choice! John was certainly very different from Jerry Dodge who was playing Barnaby on Broadway at the time. They became very good friends, but they couldn’t have been more different as far as looks were concerned. Gower had a different idea in mind knowing that Martin would be different from Channing. John had already been performing since he was five. His teachers had all been professionals in the business , having themselves grown up in Vaudeville and early television. That professional work ethic was ingrained in John early on. Gower and the powers that be were probably very happy to have a seventeen year old Barnaby who was already a pro. He could hold his own eight times a week. He loved it and he knows it showed in his work. There was nowhere else that he wanted to be! Once in a while, it might be ninety five degrees, and he would be thinking, wouldn’t it be great to be at the beach instead of a matinee, but once that music started, he forgot that there was a beach! As a director, he feels like he brings a lot. What everyone has gotten under his direction is his love of the show AND of the business. There are three things in play here: He remembers pretty much everything. He wasn’t in the chorus so he doesn’t remember every single dance step as it was originally. He has a perspective from all of the Dollys he has appeared with over the years that he had even before he knew he would ever be directing it. There are moments that he has a take on, some are in the script and some are not. Some of it was Gower, some of it is not. Then you get into areas where certain things happen. SSDC (Stage Directors and Choreographers) does not allow, due to copyright laws, one to just replicate something. Unless he has written permission from Marge Champion, he is not allowed to reproduce every step Gower created. 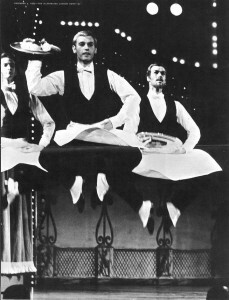 He is allowed to recreate SOME of the steps that people are used to and expecting, such as the duck walk and the waiters jumps. In some productions he has done, he has actually put some of those steps earlier in the number. His job is to honor and to use those things that people remember Channing, Rogers, Bailey etc. do. They are part of what makes the show work. Some of those moments ARE in the script. Is he better than Gower Champion or is he going to come up with something better for that spot? He says no. In two theaters, he had to sign a separate rider that he was not going to reproduce the original. They had a list of what could be construed as belonging to another director/choreographer or coming from another producer. They were not about to fight lawyers. They weren’t expecting someone to show up at the driveway in Lancaster, Pennsylvania, but they weren’t taking chances either. There was an issue previously with someone coming forward and saying, “you are using my work and I’m not getting paid.” John’s job is to make the show look like the original and hitting as much as you can without an exact reproduction. The last time John directed, the Dancing number was about ninety percent his. He doesn’t even know if Gower would have recognized it if he saw it. John says he will never JUST choreograph the show again. In those instances where he has, he didn’t have the compete vision that he would have liked. However, in one of those productions, the director did something fabulous in the hat shop scene that John loved! John told the director to please understand that he was stealing that bit. John loves the show so much, and there is such a high style to it, that it is imperative that his actors remain within those guidelines. John feels he should have been around during the Vaudeville days. He understands and relates to that timing. He did grow up during the days of live television. All of those great comedians came out of the Vaudeville tradition, Jimmy Durante, Abbott and Costello, Martha Raye…the list goes on and on. John himself did revues when he started at five. He was not in a book show until he was ten. He is a nice guy but John is extremely hands on when he directs. Once the show is up and running, he does not continue to tweak and he doesn’t want anyone else to tweak the show. We are now getting into an area where it is a raw nerve for John. Not just about Dolly but regarding all shows. Why is he paid? Why does he slave over making a show work? He blames a lot of acting teachers for encouraging their students to be organic. He doesn’t give a damn about “how you feel.” The audience doesn’t either. John is not an actor’s shrink. If you have a sore throat or a sprained ankle or anything else that may infringe upon your performance, then, he cares. Then, he is your “mom”. He takes care of his people. He is not as bad as giving line readings. He is a real boy scout. He creates a model stage prior to a project with little people. He works out everything in advance. When he comes in and says “on that line, go to the table”, he is not asking for a vote. He is not auditioning. If it doesn’t work, he’ll change it. He knows what he wants. He is a Taurus! He takes a long time making decisions and then a bomb in his shoe won’t get him to change his opinion. He’s very good at these two week stock productions because he does all his prep at home. Sometimes people have different qualities to pull upon on staging. When he is told, for example, Sondra Lee did this, his response is “you didn’t hire them.” What Sondra Lee did may not work on another person. He has never had a director disagree with him on Dolly. He doesn’t like too many cooks on any project he is heading. He has directed eight productions. He really hasn’t had a problem in terms of the women he has directed as Dolly. On one or two occasions, the actress has been uncomfortable breaking the fourth wall in those “conversations” she has with the audience. There is a moment that truly stands out for John in Sally Struthers’ portrayal of Dolly. The speech to Ephraim to let her go. She is just so lovable. The audience just relates to her. The audience feels that she is fighting just like they are. She looked great on that stage and she looked great in that red dress. As broad as she can be, she has this vulnerability. She also looked great in the finale Wedding gown. Directing wise, he only had one bad experience with Dolly. He had a friend who had wanted to do Dolly for years. It was a theater in which the “star” also produces. Although he loves this actress, there were always dramas surrounding her. He just didn’t want to be involved in that situation. He told her he would just like to remain friends. She had decided to do Dolly. He designed the sets for that production. Finally, he felt bad because she had wanted to do it for so long. He consented to choreograph. He insisted that that was it and that he didn’t want to be involved with the “dramas.” In this theatre, they want to cut things and add things and switch things around. No sooner does he agree to be involved and he gets a call that they are adding one of the numbers from the movie. the young musical director says that he doesn’t like I Put My Hand In and that he is switing that with Just Leave Everything To Me. Then they are going to add Love Is Only Love (also from the movie) and one of Ethel Merman’s numbers! This is all for a woman who is not a major singer. She sings fine but you wouldn’t buy an album of hers. She was not a vocalizer. Out of all the Dollys John has worked with, she is the only one who used Channing’s keys. Sge also wanted to change the placement and scene locals of some of the numbers. He once again stated that as choreographer, he would not stage one moment that is not in the original. If she started singing Love, Look in My Window, he was walking out of the theater into the lobby. It was not a reflection on her but that he didn’t want any involvement beyond the original. He knew that if he was there, she would come up to him and say, “I know you’re not staging this, but do you think I should do such and such?” anjd he would end up staging it. He was here in the sole capacity of choreographer. It became difficult because the woman hired to direct got sick. She missed rehearsals and she was on heavy medications. She had a flu that gave her vertigo. She was sleeping during rehearsals! She was a woman who had worked with David Merrick at one time but was not used to directing musicals. They got along great but he didn’t want to step on another person’s toes. He had had that done to him. He has staged things a little different for compensation purposes. For example, he has put women in the Hello, Dolly! number when there is a shortage of men. Most producers first balk about that idea upon hearing of that. He once staged a production at a college in which none of the men could dance! In Patchogue, he had six guys! When you have a forty foot proscenium, that will not make for a great Dolly number. He suggested just adding four more women to the number. The Waiter’s Gallop became a Can Can number. Everyone loved it on both sides of the footlights. They were doing splits and all those goes with that. One of John’s strongpoints is making dancers look good. John: Well, since we don’t have a ramp, you’ll be standing center stage as the parade is forming behind you. She was having trouble learning her lyric and had to SEE the crowd up ahead. She wanted to know why they couldn’t come down the aisle and through the house. John explained that the audience would not be looking at her or listening to her. This turned into a forty-five minute phone call. He told her that if she wanted, he could put her upstage with the entire parade in front of her. There was no explaining her constant questions. John saw all the New York Dollys except Phyllis Diller and Ginger Rogers. Out of all the Dollys he has ever seen, appeared with, or directed, only two missed the mark. They will not be mentioned here. One as a hot singer. The problem was that they did not understand the play when they got cast. They were really uncomfotable with the broadness of the play. They were trying hard to be “legit”. One of the women, he did not direct. He only choreographed. They were talented women with Broadway credits. One of them even had a television career. One belted out the songs in Merman’s keys. She gave the director grief all the time. They opened on a Wednesday and it took her through the weekend to see what the audience was laughing at, not just with her part but with the entire production. ln the rehearsal process, they were working around a lot of conflicting schedules. By the time they got to putting the show together, they should have still been rehearsing. The director needed her to see the rest of the show to get it to understand why she was being asked to do these things. Both of these actresses read their lines well but could not get the fun or the style of it. Because of that, one of the Dollys, one he directed, the energy level would go down when she was on the stage. Again, a good actress, a good singer, although the keys were terrible for her, the problem was she didn’t get the high style of the show. It wasn’t in her. You can’t just take anybody, put the red dress on them, and make the show work. He would rather have a comedienne who can break your heart on those speeches to Ephraim, rather than have a great singer who can’t capture that. Sally Struthers shocked John as a singer. He has a pretty good ear as far as voices are concerned. In the All in The Family Days, her voice was really crackly. John could only imagine what her voice would be like now. Robert Levinstein is responsible for getting John to Ogunquit. John had directed Robert’s partner as Horace Vandergelder in a production at Surflight. Robert is an associate producer at Ogunquit and suggested John when Hello, Dolly!starring Sally Struthers was announced. That’s how his name got thrown out to Brad Kenney. John asked Robert if Struthers sang in Channing’s keys. He was told no, that she sang in her own keys. John had met her when he was at the Ogunquit Playhouse playing various cameo roles in Annie. 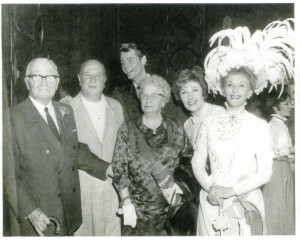 Struthers was starring in Always, Patsy Cline in the evening but he never saw the show. The following year, before Dolly, she did Best Little Whorehouse in Texas. He would LOVE to do Dolly again with Struthers! What is the biggest change John has seen in this industry since first doing Dollyin 1966? Where does he begin? He doesn’t want to sound like a bitter one hundred year old. “In my day…” In John’s home, he has models of the shows he has choreographed, directed, and designed. Right now, he is trying to promote a new circus musical. He already has the model for that, as well. He has eight different lighting plots depending upon where it is being produced. He doesn’t even have to be the designer, he is just trying to save money. He loves the tech. It angers him to go into a show nowadays and it is ALL about tech. Whether it’s the over abundance of microphones or whether its three story houses rising from the floor or whether beautiful theaters with hand carved designs and gildings and you look up to see these disgusting trusses and garbage hanging down on them. Hello, Dolly! didn’t need five hundred instruments to light a show. Oliver Smith did not have to rip out the back of a theater in order for a set to come out on stage. A friend of us, now deceased, caused a huge stir in London when he was playing the Phantom in Phantom of the Opera. He figured that he could do his own make-up in twenty five minutes. It caused a huge stir because it would have put the three people currently doing his make-up out of a job! He felt that he needed that half hour prior to the show to vocalize, stretch, and prepare. He didn’t need those people taking from his time. Where are the simple sweet stories being created anymore like Dolly where we can laugh and enjoy the material from a STAR that just draws us in without all the baggage now surrounding them where it’s not about huge scenery or putting a star on stage that should not be starring in a musical. They’re all formulaic musicals now: huge wigs, chorus girls, costumes, spectacle with no heart, not a creative aspect about it beyond the façade. The “creative” staff are all working for their jobs. The wigs want to be the star. The lighting wants to be the star. The costumes want to be the star. The sets want to be the star. It takes three to five stage managers now to run a show. One friend of John’s is on a stage manager committee in one show! The producers wanted to cut down to two and Equity intervened. Equity suggested that they would be doing better with five stage managers! He has ten Broadway credits under his belt and on three of those shows, as part of one of these “committees”, did absolutely nothing! My Fair Lady, Funny Girl, Hello, Dolly! …the list goes on and on ALL had ONE stage manager calling the show. Now there is a stage manager, an assistant stage manager, and a production stage manager out front making sure that everyone says their lines and does their thing. John doesn’t like that the technical aspects of a show have taken over. He doesn’t like composers who are making scores that cannot be sung eight times a week without destroying the voice. Next to Normal is a perfect example of this. It has practically destroyed Alice Ripley’s voice. A friend of John’s, no longer in the business is a voice repairer. A client of hers was instructed not to take certain roles. She ended up taking one of those shows and nine months later was back to repair further damage. These composers (and sometimes singers) are thinking that because there’s a microphone, you can take it easy. It’s a whole different type of projection. 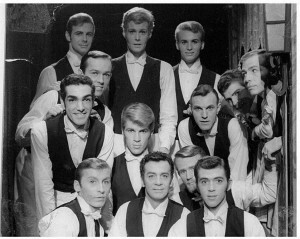 A friend of John’s, who was in Jersey Boys on the road, spent most of his time going off to replace people that were constantly out of the show due to vocal damage. He was also dance captain so he knew everybody’s part. Mary Martin, Angela Lansbury, Ethel Merman ALL knew how to protect their voices. They would have rather died than miss a performance. Something had to be very serious in order for them to miss a show. The composers who wrote for these women knew how to write for their voices. They knew what a range was. It’s now a different world. Modern day audiences that see Dolly who have seen it prior remember the title song, the red dress, the ramp etc. They sometimes have forgotten they are moved by this and how much heart there is. Are audiences still interested in an old fashioned musical with heart that relies more on the material than technical achievement? Will today’s audiences be as impressed as we all were the first time we saw it? John is still moved and working on this show ALMOST fifty years later. Yes, there are flaws in the script. How does Dolly know about Horace’s purchase of chocolate covered peanuts unshelled when she says, “I’m not some Irene Molloy whose head can be turned by a few chocolate covered peanuts, unshelled!” She wasn’t there when that transaction took place! There are a couple of those moments in the show. It’s serendipitous. It just happened. From Dolly’s “Put your hand in her right hand and stand” to the end of Before The Parade Passes By is the epitome of all that Dolly is about for John. He still gets goose bumps talking about it. That section is approximately twenty minutes long and takes you to so many peaks and valleys. The timing on this section is so perfect when it is done right. Love, Look in my Window, even though John loves the tune DOES NOT WORK in that segment. It destroys the timing AND makes it too long. John thinks of this entire section as one number. You don’t add or change from that section unless you’re a movie star in Vegas doing two shows a night! Those are the exciting moments for John, not a helicopter coming in from the flies.